An impressively powerful instrument in every way - you can't fail to be heard and felt with this. Individual style; powerful funky tones with volume to spare. It's rather heavy and unbalanced. 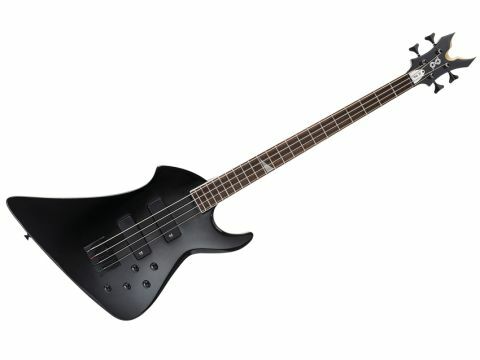 The Void IV is a full-scale bass with a metal-looking reverse body shape that features neck-through-body construction and an 18-volt active circuit. For a bit more class, the bound 'board is ebony and sports an aluminium 'fin' inlay at the 12th fret. Furthermore the unusual headstock is chamfered in the shaped 'V'-section to reveal the wood beneath - all of which makes this a pretty unusual design. It's available in gloss red, white or black, plus matt black, has a brushed aluminium finish pickguard and comes with a Coffin Case gigbag. With an active three-band EQ layout and a pair of Peavey's VFL pickups, the Void's circuitry has much in common with Peavey's popular Cirrus bass and it produces a good range of solid sounds. By using the blend control you can mix and match the VFL active pickups as you wish to unleash a varied tonal punch that is both funky and penetrating. All in all, this is a stylish addition to Peavey's bass range, with striking looks that mean you can't help but be noticed, and a stunning range of powerful sounds.